A country of intrigue and adventure, Thailand’s exotic mix of glistening temples, extraordinary annual festivals, idyllic tropical islands, and genuinely hospitable people has made it one of the world’s most popular and rewarding travel destinations. The country is home to a distinctive culture that enables old traditions to sit comfortably within a prosperous and progressive society and enrich the lives of all who visit. One of the original “Asian tiger” economies, over the past two decades Thailand has survived boom and bust, undergone recovery, experienced political upheaval, and still welcomes all travellers with a warm and gracious smile. Enchanting Thailand is a vivid and colourful introduction to all the major tourist sights and places of interest throughout the country, from the cosmopolitan metropolis of Bangkok to fascinating but little visited regions in the northeast. 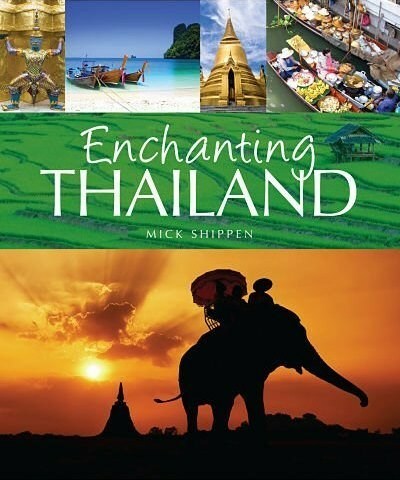 Mick Shippen is a freelance writer and photographer who has lived in Thailand since 1997, first in the northern city of Chiang Mai and currently in Bangkok. He travels extensively throughout Asia conducting research for articles and taking photographs for local and international publications. He is the author of The Traditional Ceramics of Southeast Asia, and a keen biker who spends his spare time motorcycling – he has toured extensively on- and 0ff-road in northern Thailand and Laos.